This web of silk nanofibers produced by the new bioinspired process was able to sustain a load 4000 times its own weight. Photo: Silk Lab/Tufts University. Researchers at Tufts University's School of Engineering have developed a new bioinspired technique that transforms silk protein into complex materials that are easily programmable at the nano-, micro- and macro-scales, as well as ultralight and robust. Among the varied structures that can be generated are a web of silk nanofibers able to withstand a load 4000 times its own weight. The research is described in a paper in Nature Nanotechnology. Structural proteins are nature's building blocks, forming materials that provide stiffness, structure and function in biological systems. A major obstacle to fabricating comparable synthetic materials is natural materials' hierarchical structure, which confers unique properties from the molecular level to the macro level. When scientists try to emulate this structure, they often find that control at one scale hinders control at other scales. 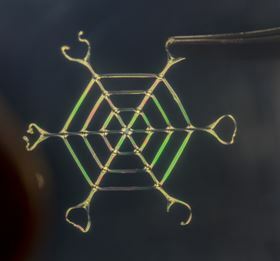 By combining the bottom-up self-assembly characteristic of natural materials with directed, top-down assembly, the Tufts researchers were able to control simultaneously geometry at all scales, micro-mechanical constraints and solvent-removal dynamics – all of which determine biomaterial properties. "We generated controllable, multi-scale materials that could be readily engineered with dopant agents. While silk is our main focus, we believe this approach is applicable to other biomaterials and composites and synthetic hydrogels," said corresponding author Fiorenzo Omenetto, a professor in the Department of Biomedical Engineering. Omenetto also has appointments in the Department of Electrical and Computer Engineering and the Department of Physics. Using the new technique, the researchers patterned centimeter-scale silicone molds with micro-scale features no thicker than a human hair. They injected an aqueous fibroin protein gel derived from silkworm cocoons into the molds, and then mechanically stressed the gel by contracting it in the presence of water and ethanol, and/or physical deforming the entire mold. As the system dried, the silk protein's structure naturally transformed into a more robust beta-sheet crystal. The material's final shape and mechanical properties were precisely engineered by controlling the micro-scale mold pattern, gel contraction, mold deformation and silk dehydration. "The final result of our process is a stable architecture of aligned nanofibers, similar to natural silk but offering us the opportunity to engineer functionality into the material," explained first author Peter Tseng, a postdoctoral scholar in Omenetto's Silk Lab at Tufts' School of Engineering. In some of the experiments, the Tufts researchers doped the silk gel with gold nanoparticles that could transport heat when exposed to light. Tseng noted that webs spun by spiders are structurally dense rather than porous. "In contrast, our web structure is aerated, porous and ultra-light while also robust to human touch, which may enable everyday applications in the future," he said. A 2–3cm diameter web weighing approximately 2.5mg was able to support an 11g weight. This story is adapted from material from Tufts University, with editorial changes made by Materials Today. The views expressed in this article do not necessarily represent those of Elsevier. Link to original source. The discovery that spider silk has a phonon band gap could lead to the development of novel acoustic and insulating materials. Researchers have produced a biosynthetic spider silk that is the first to replicate the strength and toughness of natural spider silk.